Easter is one of the most popular and most celebrated occasions in the Western world. With just days to go for this year's Easter festivities, TheHolidaySpot brings you some interesting facts and trivia based on the occasion that you all are sure to enjoy. Read these Easter facts and trivia and feed yourself with some lesser known yet immensely likeable information related to the festival. If you enjoy this article, click here and refer it to your friends. Wish you a happy Easter. Every festival celebrated worldwide are entitled to have a historical connotations attached to it. Thus it should surprise none for the many festivals that we celebrate have been spawned by a spate of significant events in antiquity. Hence these events engrave an ineradicable impression on the collective minds of the people who felt the need to venerate it.Thus, a slew of celebrations came into existence. Similarly the history of Easter is no different. It is considered as one of the oldest and the holiest festivals celebrated by the Christians. It is a day which is duly esteemed by those who celebrate it with immense religious fervor. Thus after Jesus' crucifixion, all his disciples were distorted thinking that they will never get an opportunity to see their leader. However to everyone’s surprise, on the third day of his crucifixion, Christ rose from his dead body. Popularly known as the Resurrection of Christ, this holy event showered its followers with joy and relief, who began to celebrate the day to commemorate the resurrection of Christ. However, there are many interesting facts associated with Easter. To know more on it, explore the information enlisted below. The name Easter derived its name from the Anglo-Saxon goddess Eastre, which symbolizes hare and egg. Easter always falls between March 22 and April 25. Easter is however now celebrated (in the words of the Book of Common Prayer) on the first Sunday after the full moon, which happens on, or after March 21, the Spring Equinox. Since time immemorial, egg has been considered as the symbol of rebirth. 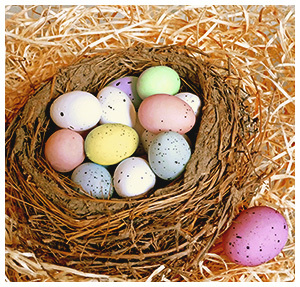 The first Easter baskets were designed as such so as to give it anappearance of a bird's nests. The custom of giving eggs at Easter time has been traced back from Egyptians, Gaul, Persians, Greeks and Romans, to whom the egg was a symbol of life. During the medieval times, a festival of egg throwing was held in church, during which the priest would throw a hard-boiled egg to one of the choirboys. It would then be tossed from one choirboy to the next and whoever held the egg when the clock struck 12 was surely the winner and will retained the egg. Americans however celebrated Easter with a large Easter egg hunt on the White House Lawn. Pysanka is the term used for the practice of Easter egg painting. The maiden chocolate egg recipes were made in Europe in the nineteenth century. Each year nearly 90 million chocolate bunnies are made. Besides Halloween, Easter holiday also paves way for confectionary business to prosper. When it comes to eating of chocolate bunnies, the ears are preferred to be eaten first by as many as 76% of people. Easter Bonnets are a throwback to the days when the people denied themselves the pleasure of wearing fine angels for the duration of Lent. Kids' favorite Easter foodstuff comprises of the Red jellybeans. Some Churches still keep up the old tradition of using evergreens - symbolic of eternal life - embroidered in red on white, or woven in straw, but most now prefer displays of flowers in the spring colors of green, yellow and white. The date of Passover is variable as it is dependent on the phases of the moon, and thus Easter is a movable feast.